Baltimore is well known to have a plague of “food deserts” – city neighborhoods lacking access to decent groceries and fresh fruit and produce. 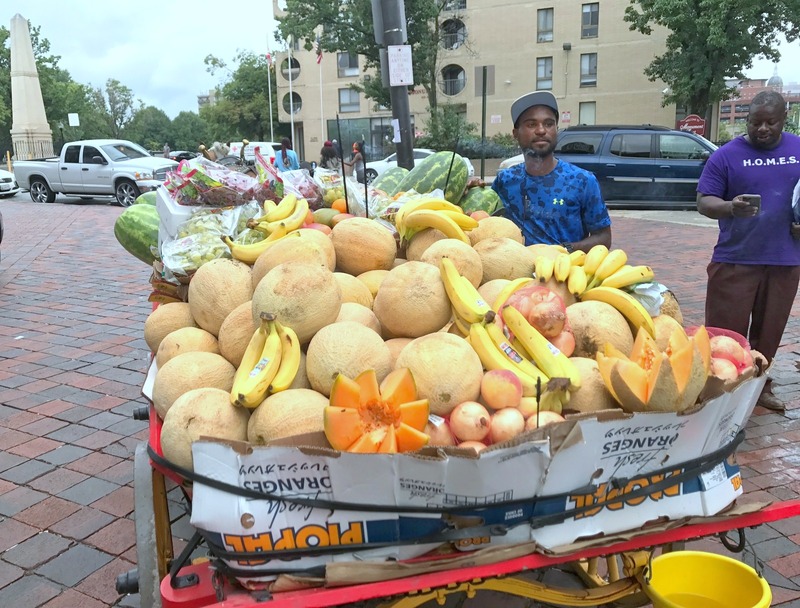 Also famous here is an indigenous and seemingly tailor-made solution: Baltimore’s arabbers, fruit and vegetable peddlers who hawk their wares on brightly painted, horse-drawn carts they take into rowhouse neighborhoods. Why city officials have failed to protect and support arabbing, which has deep roots in the African-American community, is an even bigger mystery than the origins of this ancient tradition itself. Next month, some arabber supporters are putting on a “block party” at the MAXgallery in Butchers Hill, where people will be able to meet and talk with arabbers, check out some horse-themed art work and celebrate the tradition. Funds raised by the event, including a portion of the proceeds from artwork for sale, will go to the arabbers in hopes of helping them protect their livelihood. 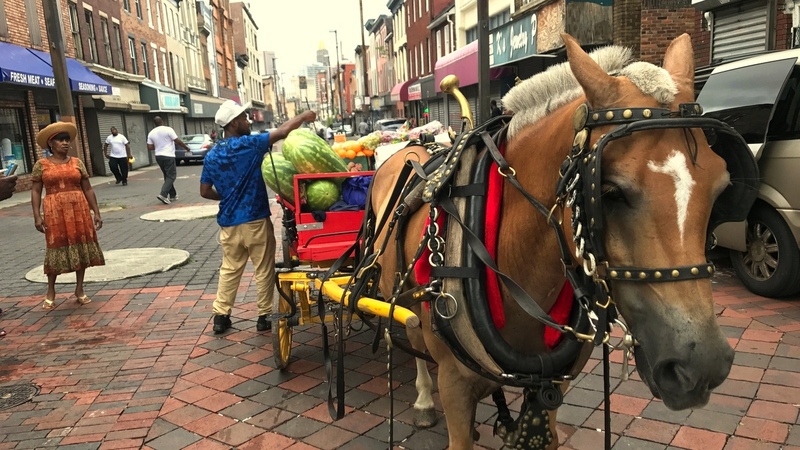 If you’ve only read about Baltimore’s arabbers – or just caught a glimpse of one of them clip-clopping down a street, harness bells jingling and a cart piled high with colorful produce – you’re in for a treat. The event will feature pony rides (for a small fee), food and live music by Brooks Long. There will be arabber-themed art – including horse-head sculptures by Leonard Streckfus, photography by Robert Sullivan, paper cuts by Katherine Fahey and artwork by Mary Bickford and Dan Van Allen. There will be sculpture by Mary Opasik, made with found objects from the Fremont Avenue arabber stables, and a variety of harnesses on display. In addition to a question-and-answer session with the arabbers, there will be a “crankie show” (an old-fashioned hand cranked scrolling puppet show) by Baltimore artist Katherine Fahey. For a complete history, a good source is “The Arabbers of Baltimore” (1989) by photographer Roland L. Freeman, who was born in Sandtown. Arabbing became widely popular after the Civil War, as the brightly decorated horses and carts moved produce from ports and warehouses into the city’s neighborhoods. As industry grew, African-Americans were initially excluded from many factory jobs, but not from arabbing. Today, Baltimore is the only city left in the country that still has working arabbers. But the number of arabbers on Baltimore’s streets has dwindled to just a few and they are in danger of extinction. The arabber tradition is worth preserving. It is much more than just a unique and beautiful cultural tradition. It provides self-employment opportunities in neighborhoods where jobs are scarce. The arabber wagons bring fresh produce to Baltimore’s “food deserts.” This is particularly beneficial for senior citizens and others with limited mobility. Best of all, if you stop by, you’ll be able to hear about the tradition from the arabbers themselves. For more information, contact organizer Robert Sullivan (202-365-542, workingimage@fastmail.com) or gallerist Maxine Taylor(410-804-7459, maxine@maxinetaylorfinearts.com). 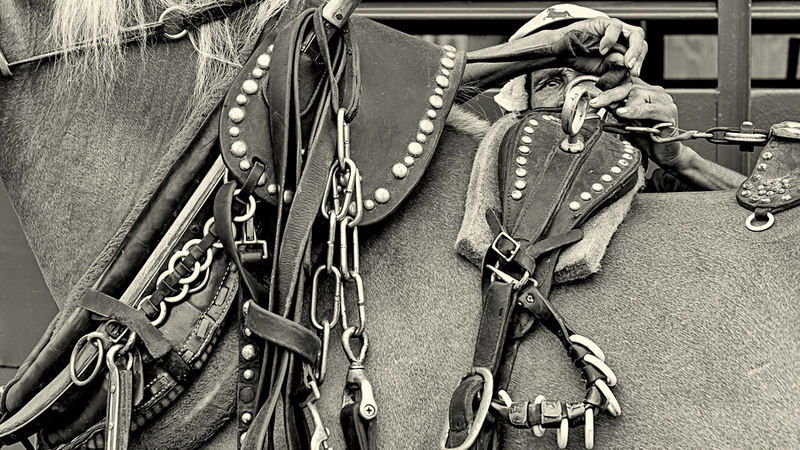 A detail from “How To Harness A Horse,” by Robert Sullivan, one of the photographs to be on display.